Dave was born in South Carolina, but in 1954 his family moved to St. Petersburg. In 1964 he had, (the good?) fortune to meet fellow Northeast High School sophomore Wes Biggs who encouraged his interest in birds and other areas of natural history. His knowledge extends from science and conservation to the fun of listing. He is, like his fellow leaders Biggs and Knight, a major bibliophile with a vast knowledge of the history of Florida, the U.S., the Civil War, the British Royal Family and the Bible. Ask him a question about any of these subjects and we’ll get you a life bird for every question he fails to answer correctly! Dave is a founding member and two-time president of the Florida Ornithological Society, and was a Regional Coordinator of the Florida Breeding Bird Atlas Project as well as BBA II. Dave has participated in 284 Christmas Bird Counts in Florida since 1971. He started and compiled the North Pinellas Count for 10 years. Dave has participated in the St. Petersburg Christmas Bird Count for 48 consecutive years. 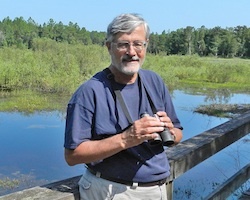 Over the past 40 years he has led hundreds of field trips for Audubon chapters, the Florida Ornithological Society, the Space Coast Birding and Wildlife Festival & Florida Nature Tours. He has participated in or led over 100 pelagic trips into Florida waters, including 31 years to Dry Tortugas. Dave has birded throughout the US, the Caribbean, and Europe, and has an ABA Lower 48 life list of 705 species. The 471 species on his Florida life list ranks him at number 3. Dave is a retired teacher, having taught history for 40 years in the public school system in Pinellas County, Florida. For the past 26 years Dave has been an environmental instructor at the Boyd Hill Nature Preserve’s summer camp in St. Petersburg. His goal is to instil in his young students the wonder, beauty and importance of the natural world and its most wonderful members, THE BIRDS !